The mudras, "seal, sign" in Sanskrit, are specific positions of the hands originally symbolising, in the Indian spiritual paintings and sculptures, a mental attitude of Buddha or powers of divinities. The mudras are sacred but not only symbolic: they also have a beneficial energetic effect on the body and the spirit. This chart explains how to use them, gives original information about the elements associated to each finger and the mudras working with each of the seven main chakras. 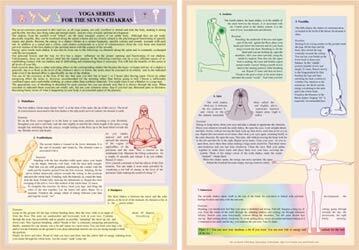 You will find at the back of the chart the description and use of the 14 best known and most useful mudras.